The Rosengarten is a magnificent area in the Dolomites, famed for its lustrous pink glow at dawn and dusk. 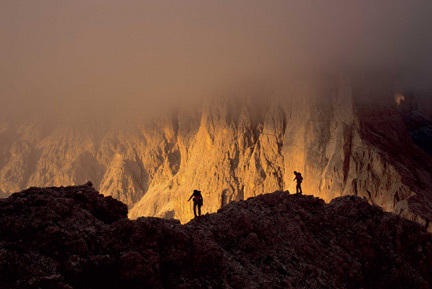 Sheer-rock faces, pinnacles and towers, plus endless unclimbed routes, draw mountaineers from all corners of the globe. If you are more of a walker than a climber, explore the wonders of the Rosengarten by way of the 'Via Ferrata.' The Italian Alpine Club has laid out hundreds of easy to difficult routes along the most scenic mountain paths.